The world's larger and older trees are dying at in unprecedented numbers, according to Professor David Lindenmayer (Australian National University). One of the first clues to this phenomenon was a Swedish study of their forestry records - dating back some 150 years. Then an Australian study of (their) Mountain Ash (Eucalyptus regnans) forest confirmed that the bigger and older trees were not only dying in forest fires, but were also dying at a higher rate (than normal) in non-fire years. There has been a similar loss of large, old pines in the forests of (western) North America - partly through selective logging but also through very severe wild fires. Back in the 1960s and 70s in the U.K., dutch elm disease resulted in the loss of many of the stateliest trees in Britain. Now, various organisms and bacterial infections [often brought in via imports to garden centres] are threatening oak, ash and other species. These large trees, in whatever biome, play a critical role. 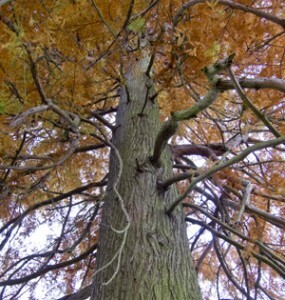 Old or veteran trees provide nesting sites, cavities for birds and small mammals to shelter, hide, breed. They store large amounts of carbon, they recycle soil nutrients and influence the hydrological cycle (through water uptake and transpiration). Through their flowers, fruits, foliage and nectar they supply food / nutrients to a diverse array of animals. Sadly, the loss of these trees may be likened to the loss of many large bodied animals - from whales, to rhinoceroses and elephants. Trees are dying (and I can provide the evidence) of being over-clothed in ivy- despite the cries to the contrary. 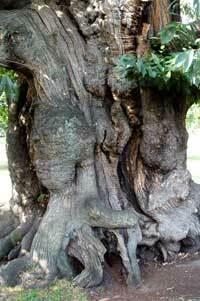 With reference to this, can I advise anyone (UK) interested to follow the ATF( Ancient Tree Forum), and also the Ancient Tree Inventory- a wealth of information on the maintenance and care of veterans, and also on their locations exists.